Polycystic ovary syndrome, or PCOS, affects about 5 million women in the United States, according to the National Institutes of Health. The condition causes diverse symptoms, and its causes are poorly understood. The definition and even the name of PCOS have been subject to debate. An NIH panel concluded in January 2013 that the name’s focus on a specific symptom – ovarian cysts - that is not present in all PCOS cases caused confusion about the condition. Three separate diagnostic classification systems have been developed to help identify PCOS. Excess production of male hormones called androgens. Anovulation, a condition where the ovary does not release a mature egg each month. This causes irregular menstrual cycles. 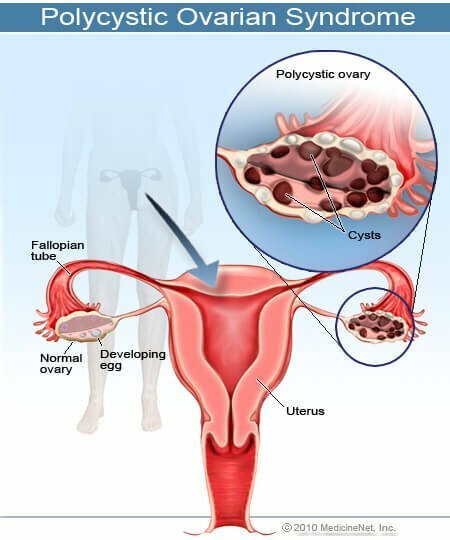 The formation of clusters of pearl-size cysts containing immature eggs in the ovaries, which is called polycystic ovaries. Initial treatment of type 2 diabetes or impaired glucose tolerance in women with PCOS should be diet and exercise, with metformin as a second-line therapy. The Hormone Health Network, The Endocrine Society’s public education arm, has published a fact sheet that explains how PCOS affects the body and outlines treatment options at http://www.hormone.org/diseases-and-conditions/womens-health/polycystic-ovary-syndrome. Other members of The Endocrine Society task force that developed this CPG include: Silva A. Arslanian of Children’s Hospital of Pittsburgh; David A. Ehrmann of University of Chicago; Kathleen M. Hoeger of University of Rochester Medical Center in Rochester, NY; M. Hassan Murad of The Mayo Clinic in Rochester, MN; Renato Pasquali of Orsola-Malpighi Hospital in Bologna, Italy; and Corrine K. Welt of Massachusetts General Hospital in Boston, MA.